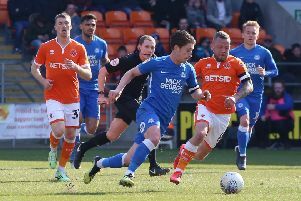 Barton, whose side lost 4-2 at Oakwell, is said to have clashed with Stendel in the tunnel following the clash in South Yorkshire. The Yorkshire Post have claimed that the two management teams clashed towards the end of the game after tempers erupted in front of the dugouts. The alleged assault was said to have happened on the way back to the dressing rooms. Police are now thought to be investigating the incident. Video footage surfaced on social media showing Barton being stopped by police after attempting to leave Barnsley’s stadium in a BMW with Town CEO Steve Curwood. Barton was allowed to leave Oakwell with Curwood just minutes after they were stopped - it is not clear whether he has been questioned about the ‘incident’. Tykes goal scorer Cauley Woodrow took to social media after the game claiming Barton had left his boss Stendel bloodied. That tweet has now been deleted. Barnsley issued a statement following the game, which read: “The club can confirm there was an alleged incident in the tunnel area that took place following the conclusion of today’s match, which South Yorkshire police are currently investigating. Fleetwood Town have declined to comment. 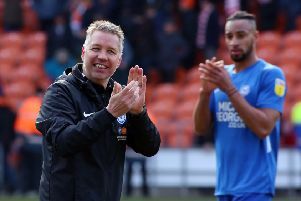 Posh play at Fleetwood in a League One game on Good Friday.